Never try to represent yourself as high end if you don’t offer high end. Picture frame molding comes in all shapes and sizes and made of many different materials. As part of the first thing I try to tell photographers is that not all frames are of the same quality. While cheaper, less expensive frames, may seem like a great deal, they also tend to be made of cheaper materials. This means they might not join as well in the corners, be more likely to show scratches and likely be lighter in weight due to softer woods being used. More expensive picture frames will feel more solid, look better in the corners and be more resistant to the stresses of shipping. Assume a very discriminating client will know the difference and not be happy if you try to cut too many corners. With smaller prints provide a ½ to 1” border extra around the image. If the print needs to be matted, this extra border can help the framer secure the print better behind the mat. If they don’t need it, they can always trim away the border. Bigger prints should be provided mounted. Mounting a print can be a delicate process, and some framers do not want to be liable if something goes wrong. Thinner mounting substrates like artboard or dibond is a good choice to mount a print on since they are relatively thin. Thicker items like gatorboard or foam core might limit your framing options. A picture frame should accent your photograph and not take away from the presentation. 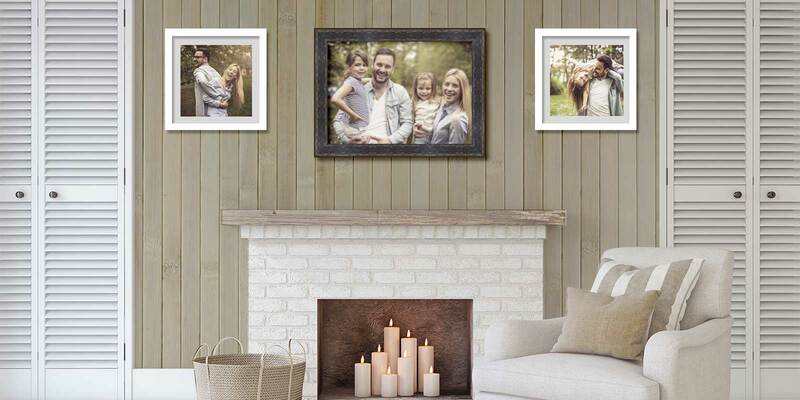 While things like a large print of a family photo meant to hang over the fireplace would ideally be in a frame that appears more elaborate, more fine art or smaller prints will probably do better in a smaller and simpler frame style. Matting can be a way to make smaller prints into a larger presentation. A trend for many fine art photographers is to place smaller prints inside much lager frames. The matting acts as a border that fills that space between the print and the frame. Your local frame shop will allow you to review many different colors and tones to see what color and style of mat helps accent your photo the best. Generally, unless you put your print on canvas or protect it will a gel, you should always include glazing. In layman terms, this means placing it behind glass. It may not be actual glass you need but instead acrylic panes. Acrylic is best if you plan to ship the print since the risk of breaking is minimal while glass is hard to keep safe during shipping. Like frame moldings and mats there will be different choices of the caliber of glazing. I recommend glazing that is conservation grade, meaning it has UV blockers to help with the longevity of the print. You will also find glazing types which offer reflection control or no glare. Some people don’t mind the reflection off the glass but if you know it will be displayed in an area with a lot off lights or direct sunlight, you might want to opt for a no-glare option so that the details of the subject matter do not get hidden behind the reflection. Find out if your local frame shop can package and ship your framed print. Don’t be surprised if it is very expensive but, in most cases, they will be able to safely package and ship the print better than you can. If you choose to do it yourself, here are some basic things you can do. Use bubble wrap to fully encompass the frame so that it is about 4 inches larger in width and height. Use a box, preferably a side loading box that will securely hold the framed work so that it will not shift around while in transit. If you have a little bit of extra space you need to fill, use something like Kraft paper or bubble wrap to fill the void until the frame fits snug. Whatever you do, do not skimp on the packaging. Use plenty of packaging tape to secure the box closed. Finally make sure you insure the package for both the cost of the frame and the value of the print. Make sure you have receipts for these because if you have to file a claim for a lost or damaged shipment, the shipping service may require this as proof of the value. For bigger framed prints, consider constructing a wood crate. At FinerWorks, if a framed print cannot be safely box or exceeds on of are larger box sizes, we will crate it instead. Even though we might be able to construct a sturdy wooden box, the weight of the frame is usually to much for cardboard to withstand. While the process of framing a print on the surface may seem simple on the surface, as you can now see a lot variables come into play. Places like FinerWorks can simplify things since we can offer everything printing, to framing as well as ship your print. This means most of the hard work of fulfilling an order is taken care of. But if you don’t mind doing it yourself and prefer to work with your local framer, then hopefully these tips will be useful in turning your photography into finished works of art. Thanks Ben! Looking forward to seeing you at the next Photo Meetup as well!